It’s New Year’s Eve and the city has spent the last week preparing for this magical night as the Year of the Mouse turns to the Year of the Ox. 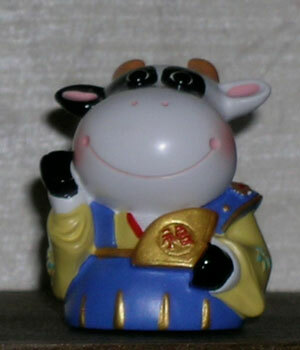 Everywhere I look, little cow decorations are dressed to the nines ready to celebrate their turn in the Chinese horoscope. According to tradition, the Year of the Ox represents prosperity through fortitude and hard work, but these features are a bit less apparent in the whimsical party favors popping up in the stores this week. Many people are, of course, familiar with the Chinese Horoscope as a 12-year cycle of animals, but the full cycle actually takes 60 years, as each of the animals cycles through each of the five element/color sequences: Wood/green, Fire/red, Earth/ yellow, Metal/white, Water/black. Thus, 1997, the last Year of the Ox, was a Red Ox (dynamic, volatile, impulsive), while 2009 is a Yellow Ox (stable, grounded, sincere) and will take on a different character. What it becomes will even depend, even more than in other years, on the work we are willing to put into it. May all of your efforts bring you great rewards! Happy New Year to all. This entry was posted in holidays, Kyoto living on December 31, 2008 by admin. A few weeks ago, I got this amazing award. In fact, it’s called the Über-Amazing Blog award. Just knocked my socks off and I’ve been blushing ever since. It’s taken me a few weeks to make this shy admission in public that I have been so honored. My nomination for the award came from Nicole who writes the wonderful blog at deliberatelife.com, which I highly recommend in return. Not only is her own blog a great read, but she’s also led me to many other interesting blogs through the links she’s chosen to list in her sidebar. Thank you, Nicole. Put the award logo on your blog or post. Nominate at least 1 blog that you consider to be Uber Amazing! Let them know that they have received this Uber Amazing award by commenting on their blog. Share the love by linking your post about this award to the person you received your award from. the Elbis stories by Mulele Jarvis at mulele.com/comics. Although on hiatus at the moment, the story archives are a wonderful collection of 3 to 5 panel manga stories published one panel per day during the past year. Mulele is a talented artist, for sure, and the tone of his writing is calm, modest, and appealing. I love the philosophical musings told through the life of Elbis the cat, and I’m looking forward to a new set of adventures in 2009. In the meantime, enjoy the archives. They’re so worth reading. Sadia was my first digitizing teacher at the American Embroidery Conference in 2007. Though I haven’t seen her in a few years, I do keep up with her through her blog. For those of us in the digital embroidery world, Sadia is a constant font of information and inspiration. Isn’t it lovely how blogs make the world go round. Thank you, Nicole, Mulele and Sadia for contributing so much to my world. This entry was posted in A bit more about me, blog award on December 21, 2008 by admin. I confess I was a bit surprised that my last post sparked so much interest. I’ve been in love with pojagi since I saw an exhibit called “Patterns and Colors of Joy” at a museum in Osaka around 15 years ago. And since I’m aware of a modern pojagi artist, Chunghie Lee, who is quite active in the international art textile scene, teaching at the Rhode Island School of Design in the US and exhibiting at the Victoria an Albert Museum in London, I had thought that pojagi was better known. Techniques for creating textiles this luscious certainly deserve to be better known. So let me do my best to say a bit more. These first three examples show traditional pojagi from the Choson dynasty and all three were made from scraps of silk. 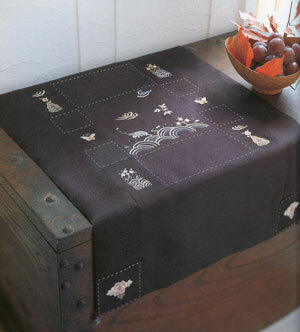 Ramie, a bast fiber similar to linen, is another fabric commonly used to create pojagi. Fabric scraps were generally rescued from worn out hanbok, which is actually just a contraction for a longer term that translates simply as “Korean clothing”. 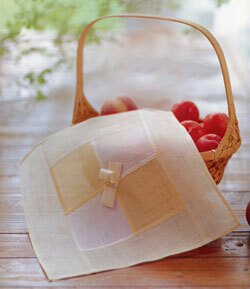 Many of the elegant white on white pojagi made from ramie had once been petticoats or pantaloons. Some of those lovely white wrapping cloths show delightful variations of cream, ivory and pale yellow, because the garments from which the fabric scraps had been rescued had aged and yellowed at different rates and the seamstress worked those variations into her composition. Often silk pojagi, like the one shown at right, include small embroidered designs that had once graced a sleeve or neckline. These treasured tidbits are carefully preserved and recycled into newly beautiful and graceful housewares. Small silk wrapping cloths might be used to wrap jewelry or porcelain, while ramie cloths might be used while serving food. One of the charming customs I observed during my recent trip was that food was initially presented covered with a lovely cloth. In the pojagi picture shown my previous post, you can see the foot of a wooden tray, peeking from beneath the pojagi and a mysterious object hidden beneath the cloth. Most likely that would be a pot of food. After the tray has been carried to the table, the cloth is dramatically removed to reveal the prepared food. In the Choson period, the availability of scraps used to make pojagi was dictated by sumptuary laws. In the modern period and certainly in the west, there are few limitations on clothing choice. But throughout medieval Asia, many countries had strict regulations limiting the clothing choices of specific classes. In Korea, commoners could only wear muted colors, and the lowest classes wore undyed fabric. The upper classes were able to wear brighter colors, and of course, finer weaves of ramie as well as some silks were available. The brightest colors—red, blue, and yellow— as well as the most refined weaves were worn by the royal family. In particular, commoners were absolutely forbidden to wear yellow, since that color was thought to represent the center of the universe. The fact that pojagi could and were made from any available fabric became absolutely clear to me during an exhibit I saw last September at the Koryo Museum here in Kyoto. One of the pieces on exhibit was dated from the 1950s and made from khaki green cotton twill. There were numbers stenciled in black on some of the patches. It had been made from old US army uniforms that had been given South Korean refugees during the Korean War. And when those clothes were worn out, they too were recycled as pojagi. One of the things that makes pojagi special is the way the patches are stitched together. There are a number of different techniques, and the choice is dictated by the fabric being recycled. Shown above is a close up of a single hairline seam being made Notice on the left how tiny and closely overcast seam is stitched. This technique would be particularly applicable to a fine fabric like silk organza. When I took a pojagi-making class here in Kyoto a few years ago, we used cotton embroidery floss to give a boldness to our seam stitch. 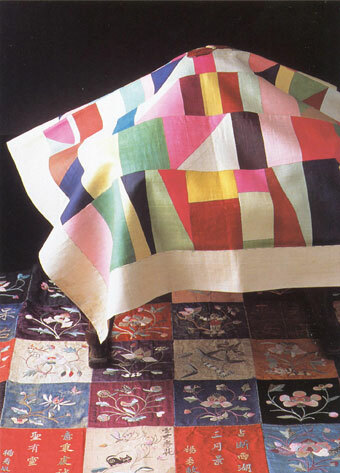 Often a contrasting color is used, giving even greater strength to the stitch as a design element. In addition to the single hairline seam shown above, there are double and triple hairline seams, a flat fell seam using running stitches and several variant combinations of the two. One such combination of a hairline and running stitch is shown at right. This kind of seaming technique gives the pojagi finishes the raw edges on the reverse side, leaving the pieced fabric light-weight and highly flexible. When made of sheer fabrics, like handkerchief linen or silk organza, the pojagi appear translucent like stained glass when held to the light. Pojagi crafts are quite rage in Japan with many centers and galleries offering classes to the public. A friend of a friend has become so enchanted that she even flies to Pusan, South Korea for regular lessons from a true Pojagi master. Ramie is often a bit more difficult to find, but linen is regularly used as a substitute. And small home decor accessories like the simple basket cover shown at left are a frequent first project. Pojagi that are meant to be used as covers or lids often have a ribbon handle at the center. The ribbon is quite apparent in the picture at left, and can also be seen in the center of the second antique pojagi shown above. Those types of details provide historians with clues to the purposes for which an antique pojagi was made. Coarser fabrics, a larger size and reinforced corners indicate use in wrapping and tying up heavier bundles. Straps at one or more of the corners indicate the various types of cloths that were used for wrapping and storing precious items. Other beginner projects include coasters and placemats or dresser scarves as well as a variety of small three-dimensional forms, just as it would have been for young Korean girls a century ago. Anything to practice the seaming techniques. Of course many of the works created by modern pojagi artists have moved beyond the traditional categories of usage. 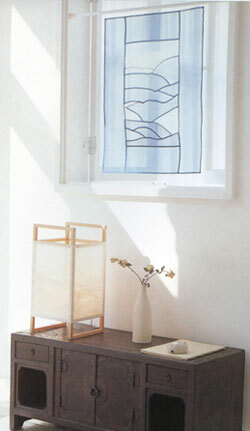 The window curtain at right is made of sheer linen in pale blue and white and seems to lean toward an abstract landscape, rather than relying on the traditional non-representational abstractions. And then again, our hectic modern lives often offer too many distractions for the peaceful rhythms of hand sewing and so, there are some artists who replace the hand-sewn seams of traditional pojagi with incredibly narrow machine-sewn French seams. And as much as I find myself in that latter category, I still admire the fine handwork of traditional piecing techniques. At left is a piece in indigo linen with hand embroidery and hand piecing. 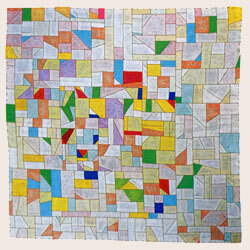 Even in this distant shot, it is easy to see how the running stitches in white thread accent some of the patchwork seams and add to the overall design. Perhaps the best known of modern pojagi artists, in the West at least, is still Chunghie Lee. 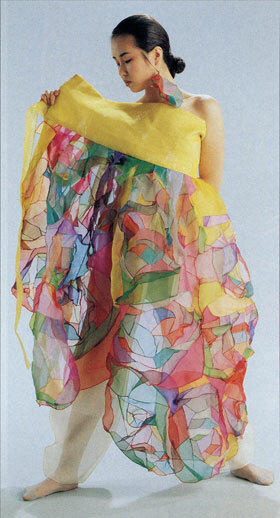 Below is an organza outfit she made in the mid-90s, which is still one of my favorite inspirational pieces. If you look closely, you can see that the model is wearing matching earrings made from three-dimensional balloon-like pojagi structures in the same colors as the skirt. There are a few more pojagi fashion pieces by Chunghie Lee in the archives of the website of the Victoria and Albert Museum. Leonie Castelino is another textile artist who incorporates pojagi as well as other East Asian textile processes into her reprertoire. I highly recommend a visit to her web-gallery as another source of pojagi inspiration. Sadly I wasn’t able to find any English-language books on this topic to suggest further reading. All of the books and catalogues in my collection are in either Japanese or Korean. Although I am aware of a few US magazines such as Ornament and Surface Design that have printed occasional articles on pojagi, it would seem that the internet remains the primary resource at present. And hopefully, my little bit of blogging on this topic has contributed something to making the beauty of Korean culture a little better known. This entry was posted in Korea on December 7, 2008 by admin. Embroidery was the real reason for my trip to Korea. Delicate and tasteful, Korean embroidery is some of the most elegant in the world. It is said that in medieval times, one of the Korean rulers owed a debt to the Emperor of China and so as payment, the emperor demanded that the women most skilled in embroidery be gathered and sent to work at the Chinese court at Xian. With that, the debt was paid in full. And it was Korean embroiderers who brought sericulture and silk embroidery to the Japanese archipelago around 300 AD. By the Choson period, Korean embroidery could be classified into two groups: Gung-su (royal court embroidery) and Min-su (folk embroidery). To supply the demands of royal court, Gung-su embroidery was produced in great variety to adorn large scale screens with grand images of pine trees and cranes, flowers and birds, and hundred-letter compositions featuring the symbols for longevity and happiness. Wooden furniture frequently had embroidered panels inset into cabinet doors, drawer facings and box lids. And the range of pouches is nothing short of amazing — incense pouches, writing brush pouches, spoon cases and a wide variety of women’s accessories. 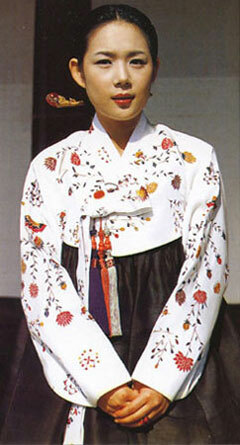 The traditional dress of Korea is called the hanbok. 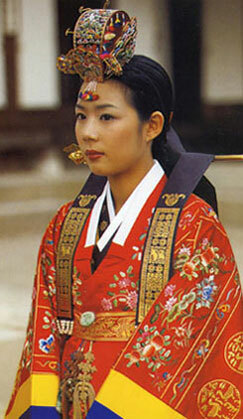 For women, the basic hanbok features a high-waisted full skirt and a short jacket. An elaborate ceremonial version with an additional over-robe and headdress is shown at right, while a simpler yet beautifully elegant modern version of the hanbok is shown above. Both are richly embroidered. Sadly (from my perspective), I could not find any second hand market for vintage hanbok. 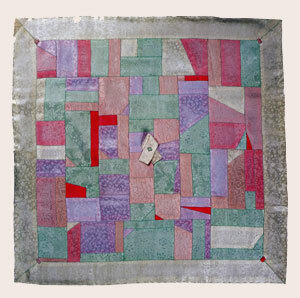 When these beautiful garments are worn out or out grown, they are simply recycled into gorgeous patchwork called pojagi. Traditionally these are used as dust covers or wrapping cloths, but now pojagi are highly valued by art collectors, who have frequently compared these textiles to compositions by European artists Paul Klee and Piet Mondrian. Two samples are shown below, but two samples can’t possibly do justice to the wide range of artistry that goes into these patchwork pieces. 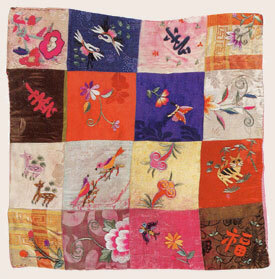 The other form of Korean embroidery, Min-su was made for common people. Free from standardized rules, the works have a more whimsical naive quality and the bolder color schemes further add to its strength and charm. The introduction of woodblock printing for transferring designs allowed more rapid wide scale production of numerous small articles, even spools and thimbles were covered with small pieces of embroidered silk. Shown below is a poster for a recent exhibition focused solely on traditional embroidered spools. Looking closely at the flat rectangular object in the lower left corner of the poster, you can see the coral silk thread wound between the yellow and crimson embroidered patches at either end of the spool. In recent years, there has been greater interest in honoring Korea’s textile heritage. 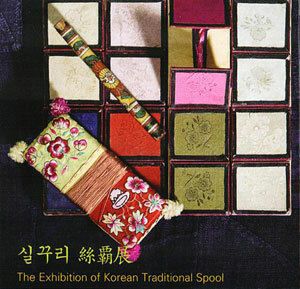 Several embroidery museums have been founded in Seoul. Indeed, Korean academics were the first to begin seriously investigating and documenting the histories of Asian embroideries. Dr. Yang Young Chung described the needle as a powerful tool that gave women the opportunity to improve their lives at a time when few opportunities existed for women. Using this tool, they enriched their lives. And as we encounter these remnants of their existence, our lives are also enriched. This entry was posted in Korea on December 1, 2008 by admin.